Everyone is different! As many people in the world as many ideas! Exquisite Landscaping will help You to choose best materials and plants to create a unique and individual space or simply create safe and happy environment for your kids to play and enjoy. Exquisite Landscaping can also provide garden design with various styled themes, influences and inspirations that will create a unique and individual space. The choice of materials is unlimited nowadays. Most popular but still in houndreds of varieties, colours, sizes, shapes and finishes we present bellow and they could be used in your project. Resin Bound is a latest alternative for driveways but also can be used for patios, paths. Resin bound is fully permeable bonded aggregate solution which allows water to freely drain through the surface. Meeting the requirements of sustainable urban drainage systems standards, this helps to prevent standing water and largely eliminates surface water runoff. Resin bound is available in such a variety of colour and textures it is suitable for any type of project; new build or refurbishment and all styles of property; modern, traditional, listed or heritage. Resin bound it’s the most sustainable, practical and versatile material for driveway. 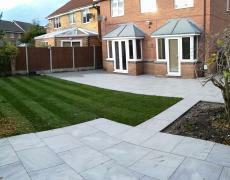 Natural Stone Paving If you're redesigning your outdoor area, choose a paving solution that's altogether different. Natural Sandstone will give your patio or driveway that touch of exquisite because each paving slab is different and unique, thanks to the many natural tonal variations, differing riven profiles and exquisite natural veining. Block Paving - A driveway shouldn’t just be functional. It should be a perfect blend of flair and function of desirability and durability that creates the perfect first impression for any property. Block paving is available in a range of traditional and contemporary designs, not to mention an array of different colours and finishes, rest assured our blockpaving has to suit everyone’s tastes. Artificial Lawn - Artificial grass is a surface of synthetic fibers made to look like natural grass.It comes in diffrent pile thicknes and shades of green. 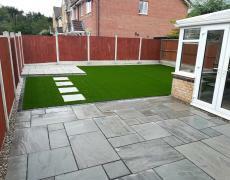 The main reason why it is so popular is low maintenance—artificial grass stands up to heavy use, such as in sports, and requires no irrigation or trimming. 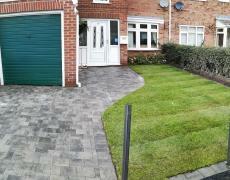 New driveway-plaspave modena paving and new lawn.